As one of its Daily Deals, eBay via Altatac is offering a new Apple iPad mini 16GB WiFi for just $300 with free shipping. A total savings of $29 off the retail price and the best current deal for this tablet. The iPad mini features a 7.9″ screen, front-facing camera for video chat and a 1080P HD video recording rear camera. Available in black or white. Applicable taxes charged for CA buyers at time of purchase. Buy with confidence. Altatac is a Top Rated Plus seller with a feedback rating of 99.5%. eBay also has a new Apple iPad 4th generation with Retina display 16GB WiFi for $450 with free shipping. 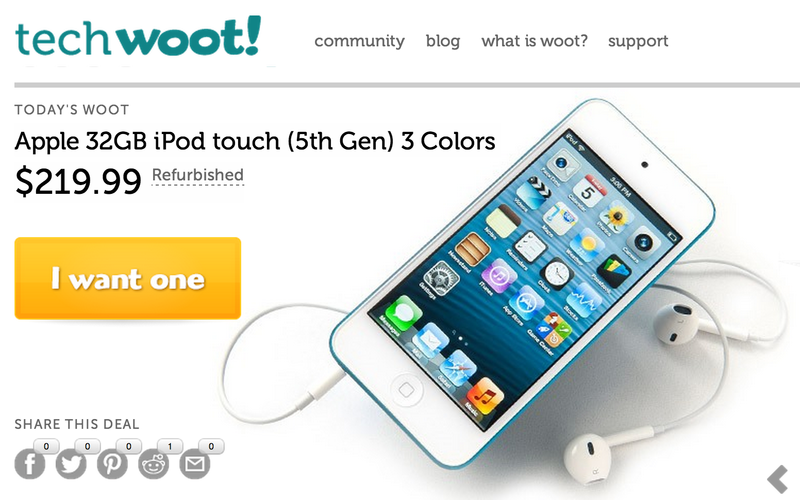 As it’s daily deal, Tech.Woot has the current 5th generation iPod touch 32GB in either Black or Blue for $219.99+$5 shipping. That’s $80 off the new price, $30 less than Apple charges for a refurb and the lowest price we’ve seen for a current generation iPod touch 32GB (It is even less than the back camera-less 16GB version). The 5th generation iPod touch is Apple’s latest and features 1164×640 Retina display, 5 megapixel rear camera, Facetime HD front camera, iOS7 compatibility and loop carrying dongle. It comes with a 90-day Woot warranty. You can also pick up a $40 iTunes gift card right now for just $32 shipped. That’s 20% in savings and a great way to get some discounted apps on that new iPod.